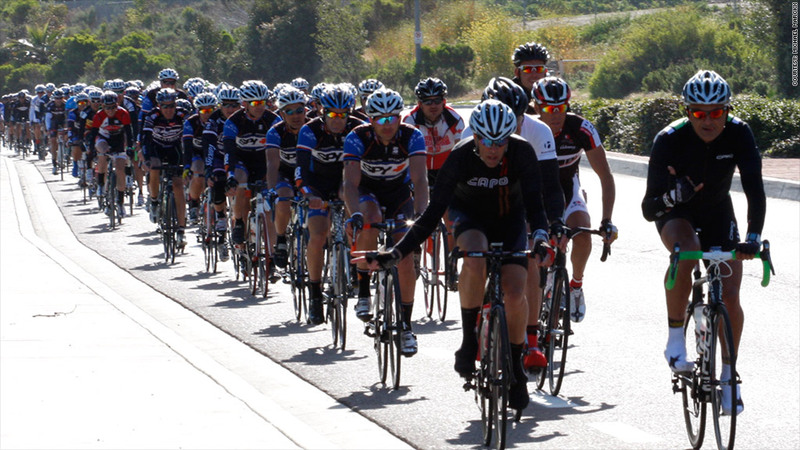 In Southern California, Michael Marckx spearheads a group of cyclists who regularly ride and network. Across America, entrepreneurs and seasoned executives are sidelining a popular networking activity -- golf -- in favor of a different group sport. "Unlike golf, cycling is also a great equalizer," said Andy Clarke, president of the League of American Bicyclists. "You're the same as the person riding next to you. So it makes people more approachable. " Entrepreneurs also gravitate toward cycling because it's a better way to stay in shape, said Clarke. It's also less time consuming and relatively less expensive. "The trend is gaining momentum in bustling business centers," he said. "But it's also taking root in the heartland of the country, in places like northwest Arkansas." In 2007, Jason Kayzar founded the Midwest Cycling Network for those who enjoyed the outdoors but wanted a change from 18 holes. "I wanted to draw decision-makers, business owners, c-level executives who are in charge of their own schedules," said Kayzar, the founder and president of Milwaukee, Wis.-based MC2, a telecom service provider. The rides started with just a few people he knew. But today, the group has 500 members and meets once a month for a two-hour, 35-mile ride. It usually attracts between 10 and 40 people -- architects, web designers, builders and small business owners -- most from the the Milwaukee area, but some from cities like Madison and Chicago. Kayzar actually struck one of his firm's most lucrative deals on a ride five years ago when he signed one of the largest scaffolding firms in the country as a client. While Kayzar said there's a little chit-chat as they ride (it's legal to ride two abreast in Wisconsin), the big chance to network comes at the end when they stop at a Mexican restaurant for chips and salsa and a round of drinks. "Unlike golf, we're not committing to a couple of hours and all kinds of expenses just to network," said Kayzar. "This is a free gathering, very informal and you're done in 2 hours." Because the monthly rides are mostly male dominated, Kayzar recently launched a second group in the hopes of attracting more women. "It's half the speed and half the distance," he said. There's no escaping golf's influence in the Southern California city of Carlsbad. It's home to Callaway (ELY), the world's largest maker of golf clubs, Cobra Golf, a top maker of golfing equipment, and a number of top-notch golf courses. But even here, many entrepreneurs are choosing cycling over golf. "It's a better cardio workout. You can get a great ride done in one to two hours as opposed to hours on a golf course," said Michael Marckx, CEO of eyewear company Spy Optic. "And you can actively network with more people." Marckx is the driving force behind a cycling group of 60 people who gather every Tuesday and Thursday for a 30-mile trek. "We get CEOs, entrepreneurs, and division heads of biotech and pharmaceutical companies joining in," he said. "Cycling is absolutely becoming the go-to activity for 40- and 50-year-olds who find it's a better compliment to their lives." Sometimes the rides result in business deals and new hires. On a January ride, Marckx met a fellow cyclist who he hired to run performance marketing at Spy Optic. Brad Swope recently broke several ribs in a cycling accident, but he's itching to rejoin his cycling group in Louisville, Ky., which he says is a "phenomenal cycling town." "You see people from all professions -- doctors, lawyers, firemen, business folks -- getting together for rides," said Swope, a marketing director. Swope said many riders in his group have ditched golf for cycling because it keeps them more active and is easier on the wallet. And sometimes a ride can turn into a networking bonanza. It was on a group ride a decade ago that Swope befriended John Schnatter, founder of Papa John's (PZZA). Their conversations during the rides eventually inspired Swope to enter the restaurant industry. He and his wife are now partners in a local chain called Wild Eggs. "It's ironic that I gave him cycling tips years ago and he would give me tips about the restaurant industry," said Swope. "Cycling can be very effective for networking."